72 pages. 275x215mm. Printed on gloss art paper, card covers. When Caledonian Railway Wagons and Non-Passenger Coaching Stock was published in early 2013, there were inevitably a number of loose ends and unresolved questions. 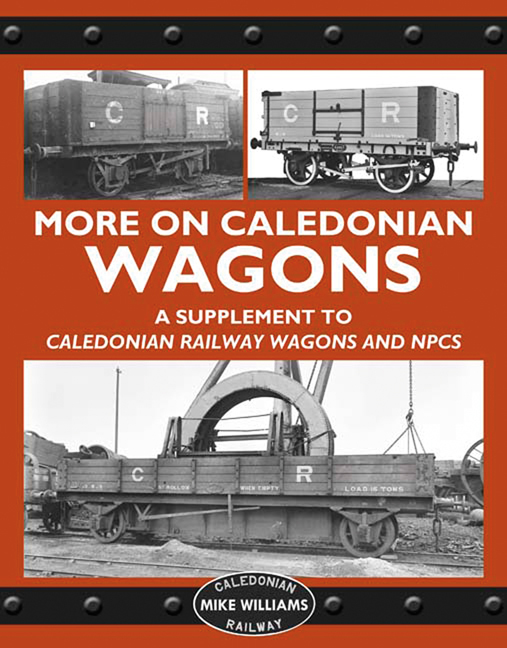 Since then new evidence and photographs have come to light which, coupled with contributions from members of the Caledonian Railway Association Forum, have answered many of the queries and added new information about the diverse CR wagon fleet, its development and livery. The volume includes a discussion on the financial aspects of wagon building, maintenance and replacement, followed by a detailed analysis of the CR抯 search for the optimum capacity mineral wagon, illustrated by drawings of proposed wagons discovered in the Stratford Works collection at the NRM. Chapters on private trader wagons, merchandise and livestock wagons, and special class designs are followed by a revised description of brake van development, including a section on the extensive use of seemingly primitive brake wagons well into the 20th century. Finally an appendix gives details of the number and type of wagons built by outside contractors, who supplied the CR with almost all their new-built wagons before the Drummond era. St. Rollox deawing 3562 shows the original style of closely spaced half-round beading applied to the Diagram 6 brake van design. It also shows at the left-hand end a sketched alteration to the side boarding to open up the verandahs. As far as is known this modification was not carried out. The second picture of the set, with thanks to Dave Lochrie for the following information about the cars on view. They are the Argyll Motor Companyy's second style of Landaulette, designated 12/14, on a standard A3 chassis. They were widely used as taxis in Glasgow, London and even New York. The design dates from 1909. They were on sale at the 1910 Motor Show for �5. This was equivalent to four times an average man's annual wage. For comparison the much more basic Ford Mdel T retailed at �0. The disposition of the MOTOR CAR VAN lettering on the Diagrm 11A CCT is fully visible.